If you eye it and make your juice about 25 percent of each of these ingredients, you'll have in your cup a divine elixir of vibrant life that will immediately improve your health on a cellular level. I tend to make about three 12-ounce portions at a time, which requires one and a half large bunches of organic kale, about 12 ribs (one stalk) of organic celery, a large bunch of organic spinach, and 5 small or 4 medium organic Fuji apples. 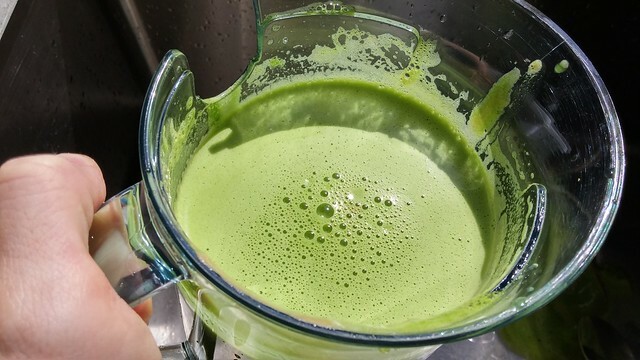 Your juice will come out with a layer or fine vegetable froth which is fine to drink but somewhat bitter, so if you're sharing this green goodness with loved ones who are a bit averse to strong vegetable flavours, you'll want to skim this froth off with a slotted spoon or even strain your juice before serving. 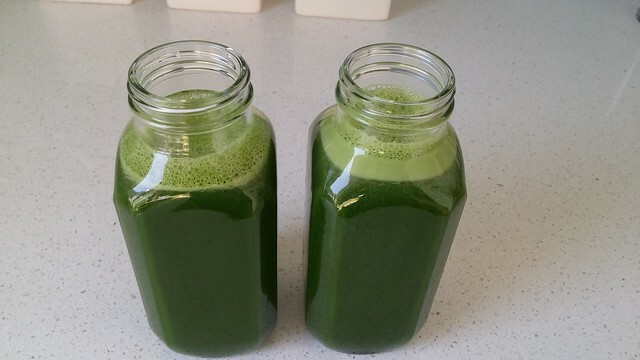 I like to take this juice to work in 12-ounce glass jars, and just before drinking, I add our organic green food powder or organic whole food multi powder for added antioxidant punch, but even without added food supplements, if you have four or five servings of this freshly pressed green juice per week, I'm confident that you'll experience noticeable benefits all over, from the comfort level of your gastrointestinal tract to the softness of your skin. With regular consumption, don't be surprised if initially, you experience headaches or a change in stool consistency, as this juice can have substantial detoxifying effects, and as your body stirs up and eliminates accumulated toxins, you may have to endure some discomfort until you feel lighter and healthier. As mentioned in our recipe pictorial for a kale, hemp, and avocado smoothie, kale is one of nature's best foods for warding off colon, breast, bladder, ovarian, and prostate cancer. This is because of cancer-preventing isothiocyanates that your body manufactures from glucosinolates that are abundant in kale. Isothiocyanates facilitate cellular detoxification on a genetic level, which is why kale is an excellent choice for any cleansing drink. 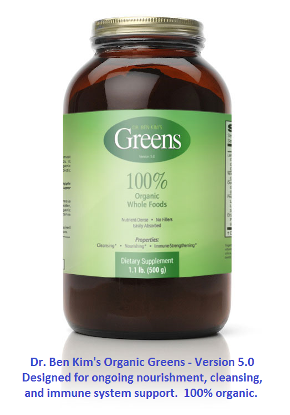 Organic celery is included in this drink for its high levels of non-starchy polysaccharides, which provide significant anti-inflammatory effects, particularly on your digestive tract lining. Ensuring a healthy GI lining is essential to your body's ability to nourish all of your cells and eliminate exogenous and endogenous toxins. 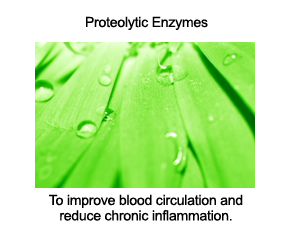 Large amounts of phenolic nutrients in celery provide significant protection against degenerative changes caused by oxidative stress from free radicals. When choosing organic spinach, look for fresh, bright green leaves, as they have more natural vitamin C than spinach leaves that are not as green and vibrant. Some research indicates that greater vitamin C content helps preserve the integrity of all oxygen-sensitive nutrients in spinach - this would actually hold true for all dark green leafy vegetables. Spinach provides a plethora of health-enhancing nutrients, but one class in particular that makes spinach a coveted ingredient in this cleansing drink is glycoglycerolipids, nutrients that may protect against inflammation and damage of your digestive tract lining. Yes, we really can't over-emphasize that maintaining a healthy digestive tract lining should be a top priority as you cleanse, nourish, and care for your cells. 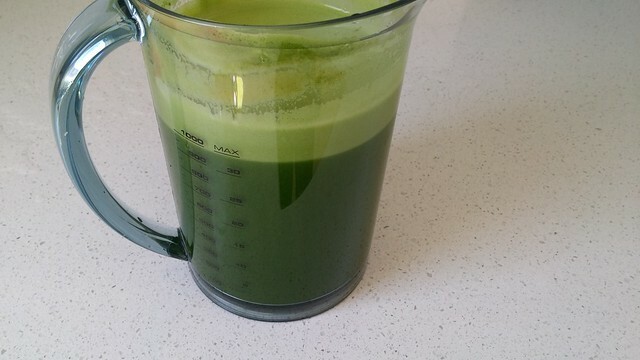 I hope you have a chance to try this green juice in the days ahead. 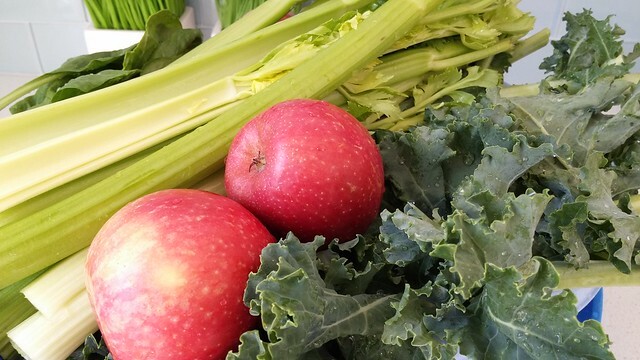 Equal parts organic kale, organic celery, organic spinach, and organic Fuji apples. The contents of this juice will separate after several hours, so shake well before savouring. Will a smoothie made of exactly the same ingredients have the same benefit? Thank you! With exactly the same ingredients, yes it will have the same benefit. How long will this keep? Can you make a week's worth at a time? It's typically not recommended to make juices more than a few days in advance. Is there a particular reason you recommend Fuji apples? What kind of juicer to you recommend for home use? Something that leaves pulp nice and dry and extracts moist of the nutrients? what can I use instead of kale? I am in France, and we cannot find kale here (except in Paris since a few months ago). Your Vitamix should work fine for this, although you may need to check the settings to see which would work best. We hope you enjoy! Have been making smoothies with my Vita-Mix for twelve plus years and use the core of pineapples avocado pits, the common meadow weed plantain which is supposed to be the most beneficial green on the planet. Dandelions including the root, purslane, very high in Omega 3. I also include sunflower seeds, chia seeds, flax seeds. Whatever I have on hand. I grow my own plantain as bugs and slugs leave it alone. Love your posts. where is your beets in this?.nothing beats,no pun intended,it for your liver health..i never juice without it..